Wheelchair or handicap accessible homes have features that make it user-friendly for the disabled. Universal Design principles may be incorporated into these designs, but not all Universal Design homes are handicap-friendly. 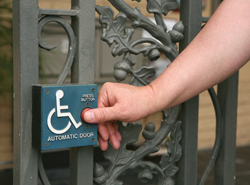 Handicap-accessible designs can be either one or two-stories and incorporate smart ideas including no-step entries, wider doorways and hallways, open floor plans, lever doors, better bathroom design, and good lighting, which all offer better function. Counter and sink heights, doorknob styles, and appliance styles are also usually modified for a wheelchair accessible home. Certain guidelines need to be met for a house plan to be considered wheelchair accessible, and even stricter guidelines if it needs to meet ADA compliance. Our collection of house plans with wheelchair accessibility offer detailed floor plans allowing a home buyer the ability to envision the look of the entire house, down to the smallest detail. With a wide variety of house plans available, see our collection of wheelchair or handicap accessible home plans.